When the door swings open at the podiatrist’s office, who is more likely to walk in: a man or a woman? Here at the NYC Center for Podiatric Care and Sports Medicine, we see both male and female patients, but we do tend to see slightly more women. Could it be the cost of high fashion? The demands women put on their feet? Or is there a genetic discrepancy? We take a closer look. Recently, UK specialists released a 3-D scan that showed the tremendous toll high heel shoes take on a female foot. “The new scanner allows us to clearly see how the foot and ankle looks and functions inside shoes fully weight bearing,” orthopedic surgeon Andy Goldberg said in a news release. The specialists noticed how the heel forced the foot into an unnatural position, which can cause pain and long-term damage such as bunions and clawed toes with frequent use. The American Osteopathic Society warns that increased weight on the toes causes the body to tilt forward and the spine to overarch, which in turn creates strain on the knees, hips, and lower back. Often, nerves can become trapped and sciatic pain can travel down the length of the spine. Over time, high heel use shortens the calf and back muscles, which leads to painful spasms. As a result, Plantar Fasciitis and Achilles tendon injuries are commonly cited. Judith F. Baumhauer MD and Kathryn O’Connor PT from the American Academy of Orthopaedic Surgeons say that women’s feet are not just smaller versions of men’s feet, and that understudied differences in foot structure, strength, laxity, and positioning are all factors that contribute to women’s foot problems. For instance, women have a wider forefoot, shorter arch length, and shorter metatarsals compared to men. Women also have a 20-25% lower volume and surface area in the ankle, subtalar, and talonavicular joints, as well as 16% thinner cartilage. Studies also show that women have greater plantar flexion, range of motion, and ligament laxity – which can make women more prone to foot injuries. Bunions – A study by Dr. Carol Frey of UCLA revealed that 88% of women wear shoes that are too small for their feet. Not surprisingly, 70% of the women in the study suffered from a hallux valgus deformity (bunion). 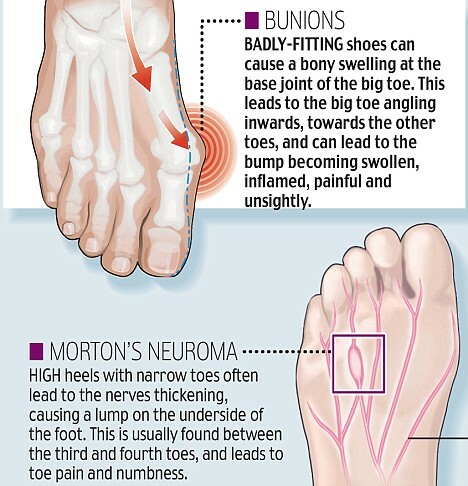 Women are 2-4 times more likely to have bunions than men. In 1991, 209,000 women had bunionectomies and 119,000 women had bunionette repairs performed. Hammer Toes – In 1991, 210 hammer toe corrections were performed on women. Neuromas – That same year, women underwent 66,500 neuroma resections. Designers are beginning to experiment with more comfortable fashions – and that’s a good thing! For instance, the new Cole Haan Air shoes were designed with the sole of a Nike Air shoe and the look of a formal business shoe. Kenneth Cole packs their comfort shoes with a flaxseed arch pillow, two layers of foam padding, flexible rubber soles, breathable sheepskin liming and impact-resistant nylon heels. At a higher price point, LA designer Dana Davis is making waves with classy heels that include customized arch supports and strategic padding. Furthermore, regular visits to podiatric care specialists can help women detect potential pitfalls before they become problematic. Custom insoles, orthotics, and braces can properly align the foot and ankle to prevent pain and whole body misalignment. If you’re in the NYC area, stop and see us!